Before a group can enjoy a faculty-led trip, there is the issue of the logistics: finalizing group size and coordinating payment. For professors and faculty members bringing a group of students abroad, managing these logistics can be a daunting task – daunting enough to deter some faculty from signing up to lead the trip. Professors do have resources they can leverage to help manage this; many engage a travel agent to book group travel to help ease the logistics of planning the trip. In fact, this is the number one reason trip leaders cite working with an agency. The only requirement a group leader needs to meet to book group flights with an agent is to be booking a minimum of ten passengers or more on the same itinerary. Booking as a group comes with advantages, including reducing seat count without a penalty charge, flexible travel until 90 days in advance and paying refundable deposits to the airlines. If a group is less than ten, full payment will be due to the airline at the time the flight is booked – leaving no flexibility for changes in travel plans or group size. 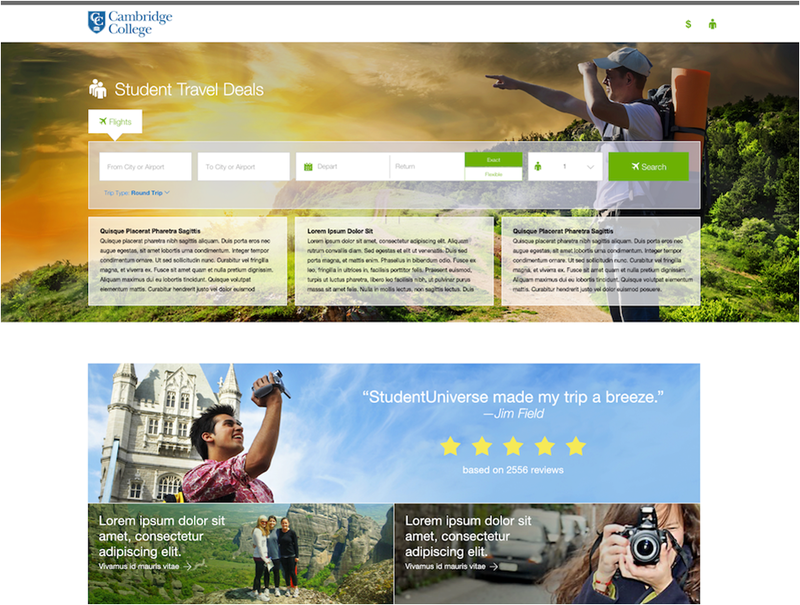 With some travel agents (like StudentUniverse), custom-branded payment pages can be utilized by the group. 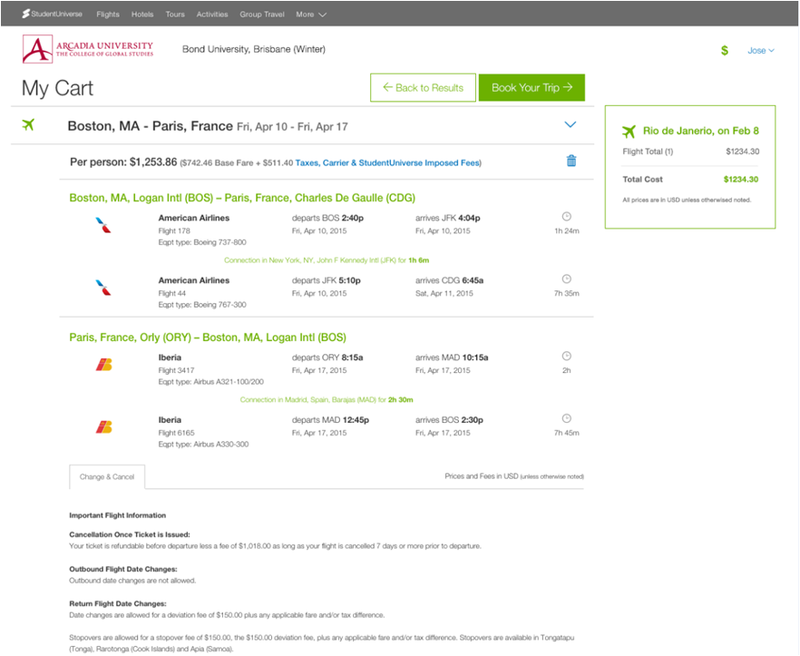 These pages outline flight information and fare rules and allow each student to pay for airfare directly to StudentUniverse (with any major US credit card) to make their reservation directly as part of the group. Participants submit their own names and passport information directly and group leader does not have to collect money or passenger information for the tickets. Examples of payment pages can be found below. Alternatively, branded affiliate pages can be utilized. In this case, group participants have full control over what they book. 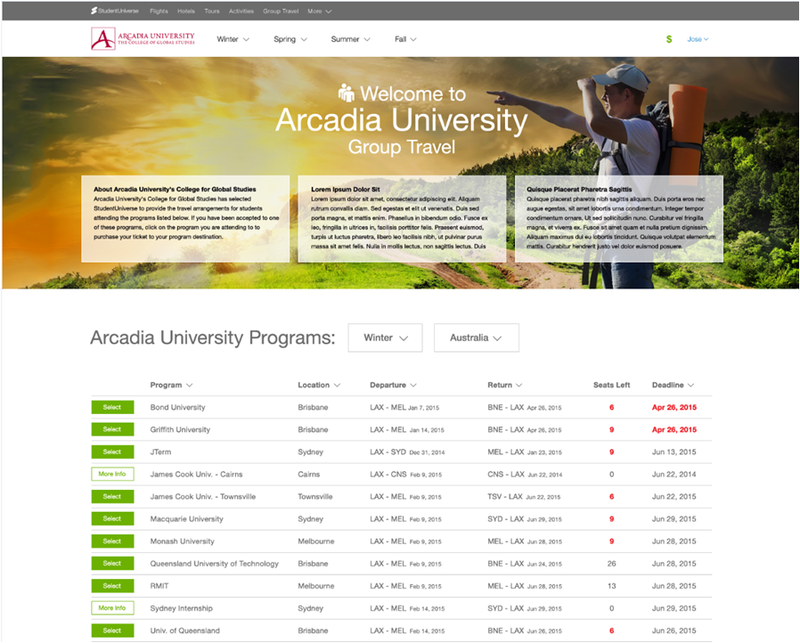 While the page contains customized messaging and can suggest flights, arrival times, meeting points, and other trip information, students book their own flights directly through the agency. This is helpful in cases where students may want to extend the trip beyond when the group is traveling. When booking on affiliate pages, students are also given the option to search hotels, tours, trains, travel guides, and tips. An affiliate page example can be found below. Whether travelers use group payment pages, or affiliate pages, the responsibility of making the payment lies with the travelers, versus the group leader. These pages also gives the group leader visibility into the progress of the group booking and the individual itineraries (in the case of affiliate pages). Another benefit of having students book travel in this way is that the agency can provide duty of care services. This includes: instant pinpoint of travelers’ locations, reservation and contact info during trips, information on the number of travelers in a specific locale and a group email feature that sends a single email or group text message to multiple travelers simultaneously. If you want to learn more about making group travel easier, visit our group travel page: http://www.studentuniverse.com/travel-services or get in touch with us at evan.becker@studentuniverse.com.